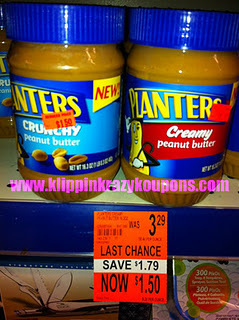 Planter's Peanut Butter only $0.75 w/ Coupon! WOW, check out this awesome peanut butter deal you can score at Walgreen's! NOTE: As you can see in the photo, this is a clearance price and your store may or may not have the same items on clearance. But this deal is definitely good enough to print your coupon now and check your store! Big thanks to Klippin Krazy Coupons for deal and photo!